The response to last week's post on the best and worst recipe websites and blogs was a reminder of this corner of the internet's astounding diversity. This week we're looking at people's search habits, starting with the graphic above conceived by Duncan Bloor and designed by Adam Hinks. 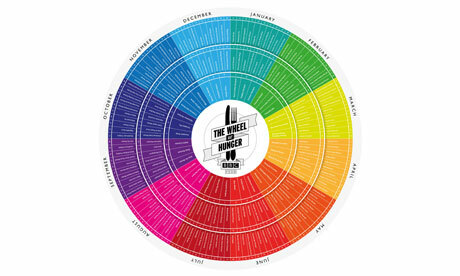 It's called the Wheel of Hunger, and it shows the 20 most common food searches that Brits make across the internet, month by month. If you want to look at it properly, you might be best downloading it so you can zoom in. The title isn't great: the name seems to imply more serious forms of hunger than are in fact intended. But the idea behind the wheel is brilliant, as are the content and design. The results are revealing, amusing and rather lovely. You trace the thoughts people are having about food throughout the year, from the guilt-riddled "healthy recipes" (the second most popular search term in January), "Mother's Day recipes" (most popular in March), the elderflower cordials and Pimm's of June and the soup dishes of September, until you get to mince pies and mulled wine in the month you'd most expect them. It may be a symptom of Americanisation that, at this time of year, the three food terms the British are searching for most are pumpkin soup, pumpkin pie and "Halloween recipes". But I love that the fourth most-popular search in October is "Christmas cake recipe": we're perhaps more organised than we claim for ourselves. By the start of November, Christmas cake will be the number one term, followed by chilli con carne – as perfect a November dish as any I can think of. Even better are the little clues the wheel offers about the workings of people's minds: what their searching says about them. February is top-heavy with inevitable pancake stuff, but then it segues into something rather more revealing. You can almost see the once-a-year cooks Googling "starter recipes", "Valentine recipes" and "dessert recipe". And I also love the wheel's steady cycle from lean times to fat and back again: the parsimonious promises of the new year, the sod-it-all bread and butter puddings of March, the beach-body-focused "low fat recipes" of April, through to the stews and toads-in-the-hole (toads-in-holes?) of late autumn. Some of the results are frankly bizarre. Why is banoffee pie the second most-popular search in March? Why is special fried rice the third most-popular of April? Can "courgette recipes" really be the most searched-for food in July, followed by marrows? Of course, the Guardian food pages have their own search, powered by What Could I Cook?. The three all-time favourite ingredients here, by some margin, are cheese, eggs and chicken. Among the dishes it's cake, soup and – intriguingly – cucumber soup, which come ahead of bread, curry, risotto and salad. Without month-by-month data I can't test whether the Guardian search matches the Wheel of Hunger, but there are few surprises on the list. And this brings me to the last thing I'd like to mention. We've been proselytised for about a decade now about the virtues of seasonality, about the tasteless, wasteful folly of green beans in January and year-round asparagus. Much of this made sense. But those who have so fiercely promoted this seasonal mantra sometimes speak as if the British public had no idea if it was snowing outside or if it was weather for flip-flops. In fact, the wheel shows we're a ruthlessly seasonal country, and probably always have been. We search for asparagus and hollandaise in May, we turn to shepherd's pie once the air chills and the days begin to shorten, we assuage the over-indulged soul with leek and potato soup in January. I've suspected it all along, but I'm glad to see it confirmed. Do you find yourself searching for the same recipes year to year? Does your eating follow a sine wave of cakes to lettuce and back again? Or are you one of the people who does a panicky search for "starter recipes" at 9am on 14 February?